reduced power consumption at the Ahafo mill (above) in Ghana. Newmont Mining is achieving sustainable improvements in its comminution circuits by taking a strategic approach to plant optimization and design, and sharing leading grinding practices across its 11 gold mining operations in the USA, Australia, Peru, Ghana and Suriname. Business efficiency and production costs have been the main drivers for change in the company’s comminution practices and, through these initiatives, Newmont has been able to reduce its production costs. 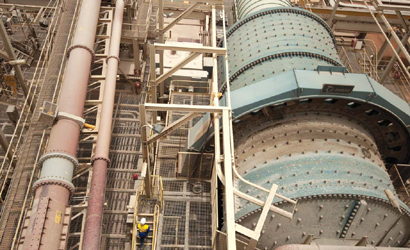 Examples include addressing power consumption at Ahafo in Ghana and reducing grinding media usage rates at operations like Twin Creeks (USA) and Tanami (Australia); boosting throughput and metal recoveries at Boddington; and increasing throughput at Kalgoorlie Consolidated Gold Mines (KCGM). Several of these optimization efforts have involved 2017 CEEC medal winners Newmont’s internal comminution specialist Aidan Giblett and Newmont Australia’s Principal Advisor Processing Steven Hart in some capacity. They are often involved in ideas generation and definition for site improvement projects in collaboration with site teams. Once the ideas are developed and defined, their roles incorporate support of operations people who take on and deliver the projects. Newmont’s well defined Full Potential program also allows other Technical Services team members to participate in the ideas generation and definition stages, supporting a company-wide focus on optimization. Giblett has 25 years’ experience in operations, project development and corporate roles, predominantly with major gold mining companies. For the past 12 years he has worked for Newmont’s Technical Services group. In his current role he provides subject matter expertise in comminution to the company’s operations and projects around the world. Giblett has been involved with site optimization studies at operations in Ghana, Peru, North America, Indonesia and Australia. His role also incorporates identifying emerging technologies and best practices in comminution around the world and incorporating these into Newmont’s operations. Hart has 29 years’ operational and design experience, primarily in gold and base metals processing. He spent six years with Boddington during the design, commissioning and ramp-up of the operation, culminating in just over 12 months as the Processing Manager. In his current role of Principal Advisor Processing, he has worked closely with the Tanami and KCGM operations, contributing to plant improvement projects in comminution, metal recovery and cost reductions. A significant component his current role is to work closely with the site-based metallurgical and processing teams on longer term strategies as well as research and development opportunities. Newmont’s strategic approach to plant optimization and design incorporates the Full Potential program and the efforts of the corporate Technical Services teams to identify and rank emerging technologies and industry developments to implement and promote the best practices across its operations. “This program has been in place for a number of years and is very effective. At the core of the program are subject matter experts and processes to screen, evaluate and rank any number of site optimisation initiatives,” Giblett said. “The Full Potential program gives sites the mechanisms to get the projects prioritised, resourced and implemented. A lot of this is due to the rigor the program puts on defining the value that will be created by the project. Value creation is a key guiding philosophy of the Technical Services team. Giblett points to project team composition as another critical success factor. “We have usually involved cross-functional teams in these projects, drawing on technical, maintenance and operational experience. Having a diverse range of people involved in the improvement projects helps with problem solving as well as ensuring a successful implementation,” he said. “We also look outside the project teams and even outside the organiztion. Plant operators make invaluable observations about plant performance; their input is essential. Vendors have a lot to offer too, as they are often the conduit for new knowledge based on product development or practical experience from other sites. Leadership is another critical success factor. Without managers who support their teams, back high-potential ideas, and encourage the generation of new improvement ideas, there is no change. Of course, the ideas need to be framed appropriately. “I don’t think you can beat a clearly presented value proposition. Know the science you intend to exploit — ideally in simple terms — be clear to the expected value, and have a well thought out implementation plan that includes securing stakeholder buy-in,” Giblett said. One of Newmont’s biggest challenges, increasing the mill throughput at Boddington, was also one of its greatest success stories, according to Hart. “The operation demonstrated early on that it could exceed the design throughput rate, with up to 130,000 metric tons per day (mt/d) processed at times during the first year of operation. However these rates could not be sustained due to equipment reliability issues, and this has been the key focus of our operation for the past five years,” he said. “Needless to say we have taken the annual throughput from 35 million mt to more than 39 million mt in FY2017, and there are still more improvement opportunities that have been identified. “Working on the ball milling circuit, we have also seen this result achieved with a reduction in final grind size due to increasing the power consumed by the high pressure grinding rolls circuit, finer feed to the ball mills, and a smaller ball charge addition to the ball mills (as a result of the finer feed). New technologies could boost the productivity of Newmont’s comminution circuits even further and Giblett points to a number of emerging technologies that look promising. “These include ore sorting and preconcentration technologies to reduce the amount of material that goes through fine crushing and grinding. We need to develop desktop characterization procedures that define ore amenability to these processes early in the project life, without the need to collect and process large ore samples at pilot scale. Once we can do that we might expect to see a larger shift in how the industry operates,” he said. Committed to documenting and sharing Newmont’s comminution improvements, Aidan Giblett, internal comminution specialist, and Steven Hart, Newmont Australia’s Principal Advisor Processing, presented a paper, ‘Grinding Circuit Practices at Newmont,’ which they presented at the AusIMM’s Mill Operators’ Conference at Perth in 2016. Giblett and Hart were awarded the 2017 CEEC Medal for the operations category for their efforts. The CEEC Medal is a prestigious annual award that recognizes the most outstanding published papers, articles or case studies that profile energy-efficient comminution and mineral processing strategies. 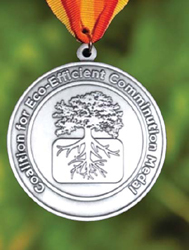 Nominations are reviewed by the CEEC Medal Evaluation Committee for applicability, supporting research and documentation, prospective impact, potential energy savings, and presentation style. Established by the industry, for the industry, the Coalition for Energy Efficient Comminution (CEEC) is an international, not-for-profit company committed to sharing energy efficient mining processes to help lower costs, increase productivity and improve shareholder value. To drive this mission, CEEC has established a collaborative global network of mining leaders, technical experts and researchers. CEEC CEO Alison Keogh said in 2017 the coalition received a record number of nominations and the competition was extraordinarily high. “Nine of the 18 papers put forward for the CEEC Medal were potential winners, demonstrating that many individuals and organizations are striving for improvements and advances in minerals processing and comminution. That’s good for the industry. CEEC is proud to share this work and inspire miners and researchers around the world to help drive incremental and transformative change,” she said. Giblett said Newmont had significant experiences in plant optimization and design. He and his colleagues wanted to share the insights from their diverse project experience and their paper was one means of doing that. “One of the things the industry doesn’t always do as well as we would like is documenting and sharing its experiences, so we wanted to do that — celebrate some successes, promote and contribute positively to conversations around effective comminution circuit selection, design and operation,” he said. Giblett said although some of the initiatives highlighted in the paper had short delivery times, the more significant projects took between two and five years from concept to execution. “There is often some time required to effectively communicate the concept and get enough buy-in to progress the project with real purpose,” he said. Applications for 2019 CEEC Medal are now open. See www.ceecthefuture. org/ceec-medal for details or email CEEC at admin@ceecthefuture.org. Applications close March 15, 2019. 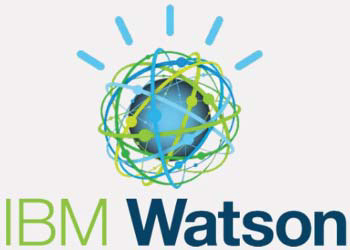 Last year, Fluor Corp. and IBM began using artificial intelligence (AI)-based systems to predict, monitor and measure the status of engineering, procurement, fabrication and construction (EPC) megaprojects from inception to completion. Fluor’s extensive engineering, fabrication, construction and deep supply chain expertise, coupled with AI and analytic technologies from IBM’s Watson, forms the foundation for big data analytics and diagnostic systems that help predict critical project outcomes and provide early insights into the health of projects. Large capital projects, especially in mining and metals markets, are incredibly complex with enormous amounts of data, people and moving parts that are constantly changing and need to be understood to keep a project on schedule and budget. To gain insights from project data in nearly real-time and to understand the implications of changing factors, Fluor is introducing the EPC Project Health Diagnostics (EPHD) and the Market Dynamics/ Spend Analytics (MD/SA) systems. Developed with IBM Research and IBM Services, working collaboratively with Fluor, these innovative tools help to identify dependencies and provide actionable insights by fusing thousands of data points across the entire life cycle of capital projects. Fluor selected IBM to assist in the development of these advanced systems as part of its global data-centric transformation strategy. These engineers can now leverage a wealth of experience from across its entire historical data store and global workforce to quickly understand markets and monitor project factors impacting cost and schedule to drive improved certainty and cost efficiency across the entire project scope. The EPHD and MD/SA systems are designed to transform complex data into actionable business insights using domain- driven semantic models to guide artificial intelligence-based predictive and diagnostics modeling. A unique feature of the systems is the blending of data with domain expertise to learn models that are operationally insightful. An advanced cognitive user interface provides seamless access to the data, reports and results of the analysis, using EPC domain-sensitive natural language conversational interface. The underlying domain understanding is used to guide project diagnostics and provide natural language summaries based on the reports, with data visualization techniques to ease its quick consumption and understanding. • Predicting issues such as rising costs or schedule delays based on historical trends and patterns. • Gaining earlier insights from many sets of complex factors across project execution. • Identifying the root causes of issues and the potential impacts of changes as input to the decision-making process including estimate analysis, forecast evaluation, project risk assessment and critical path analysis.